As I learned from personal experience movie trailers are not something to take for granted, most of the times the impression left by the movie is quite different from its trailer. I cannot say that I stopped watching movie trailers because of this, but I do not take them as guidance as I used to do at the beginning. However, I have mixed feelings when it comes to book trailers. I didn’t buy any book based on book trailers. Well, actually I did buy one, Ransom Riggs’ “Miss Peregrine’s Home for Peculiar Children”, and that proved to be a more than an excellent choice. Like the movie trailers, I do watch any book trailer that falls into my attention, but I watch book trailers also after I read that particular book which is not the case with the movie trailers. Recently I’ve seen a trailer for one of my favorite books of 2011, Marian Coman’s “Fingers and Other Fantastic Stories”, and this is one of the cases of watch/compare/imagine with my personal opinions about the book. I admit that I am not very fond of the book trailer for Marian Coman’s excellent collection of stories. Somehow, I see his book differently and I would have gone with a different approach for this trailer. Considering that in Romania we do not get many book trailers and Marian Coman’s talent deserves any form of publicity (except the negative one, of course) he can get I will salute the apparition of the book trailer. And hopefully, the next trailer for one of Marian Coman’s books will be even better. My Spanish is nowhere near as good as I would like it to be, but I would absolutely love to get my hands on a copy of Carlos Ruiz Zafón’s latest novel, “El Prisionero del Cielo” (The Prisoner of Heaven), in its original language. Especially since it will be released on 17th of November in Spain and I do have to wait a bit longer for a translated edition to read. 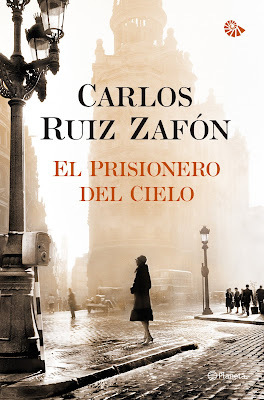 After the initial release announcement of “El Prisionero del Cielo”, pretty much surrounded by mystery, now we do have a cover art for the new Carlos Ruiz Zafón’s novel and an all too appetizing synopsis. And how can it not be, when the third novel in a scheduled series of four featuring the exciting Cemetery of the Forgotten Books has as main characters the two remarkable heroes of “The Shadow of the Wind”, Daniel Sempere and Fermín (who is one of the most delightful characters of my reading experiences). Here is the synopsis of the novel found on Planeta website in my translation attempt. Barcelona, 1957. Daniel Sempere and his friend Fermín, the heroes of “The Shadow of the Wind” are back on a new adventure to face the greatest challenge of their lives. Just when everything begins to smile on them, a disturbing character visits the Sempere’s bookshop and threatens to reveal a terrible secret which lay buried for two decades in the dark memory of the city. To know the truth, Daniel understands that his destiny leads inexorably to a confrontation with the greatest shadows: those that grow inside him. Brimming with intrigue and excitement, “El Prisionero del Cielo” is a masterly novel where the threads of “La Sombra del Viento” (The Shadow of the Wind) and “El Juego del Ángel” (The Angel’s Game) converge through the magic of literature and leads us to the mystery that hides in the heart of the Cemetery of the Forgotten Books. As I mentioned in a previous post after the initial issue Arcane Magazine changed its format in an annual anthology series. Since then the first issue became Arcane Sampler a precursor for the first Arcane anthology, due to be released at the end of this year and not in January 2012 as was originally scheduled. The first Arcane anthology will contain thirty stories and although not many names from its line-up ring a bell that was the case with the first Arcane Magazine issue too and the respective experience was more than satisfactory. Even more, I can’t think of a better way to discover new and talented voices that such anthologies (or magazines) as Arcane. Here is the complete line-up with which Nathan Shumate will start the Arcane anthology series. With most of the working projects cleared it is time for me to return to the blogging schedule. Sort of, since this schedule will suffer a bit of changes too. It has been a hectic working year and still is. Apart from this, the best thing of my life happened close to 11 months ago and he is such a delight that I often forget about everything else. My son took priority over everything else and that is reflected on my passions as well. I still read and I am still enjoying reviewing the books I read, after all blogging about them brought to my passion a new perspective. And although I know that I still have room for improvement without any regrets for the past year I left reviewing on a second plan. I have plenty of reviews to finish and a couple of interviews that remained stuck somewhere in the middle. So I believe that a small change in the blogging schedule is necessary at this point. I will still post and review, hopefully interview some of the authors and artists I love too, but I am not certain how the rhythm of the posting would be. I do hope though that you will still enjoy those posts whatever their time of appearance will be.